Snow accretion on contractions can cause malfunctions, damages of structures, or accidents. This is related to the disposition of snow, position and constitution of the equipment, location of equipment and the circumstance. We measured the slip-off angle of dry and wet snow accreting on a HIREC coated plate. The results shows snow accretion can be reduced by setting the angle of 60° or more of structure’s surface with HIREC coating. Size: 30 cm x 20cm. Put some snow on a screen, then accrete snow on the test plate by sifting the screen. Measure the weight of accreted snow on the plate. Tilt the plate and measure the angle that the accreted snow slips off the plate. The dry snow slipped off the HIREC coated surface at 30° or more when the weight of the snow is 600 g (1 g/cm²). For the thin snow the slip-off angle increases from 40° to 50°. 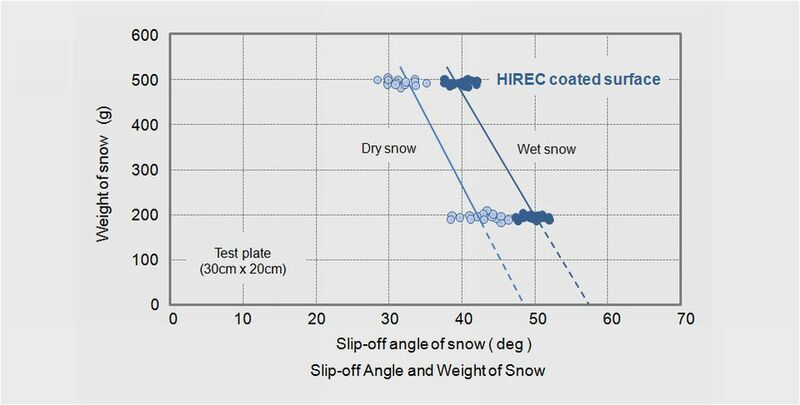 For the counter measure against dry snow accretion, the angle for the surface coated with HIREC should be 50° or more. 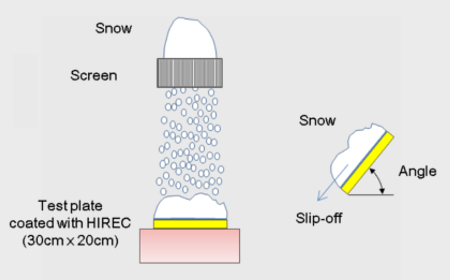 The wet snow began to slip-off the HIREC coated surface at 40° or more for the snow of 600 g (1 g/cm²). The slip-off angle of snow increases to 50° or more for the thin snow. For the counter measure against wet snow accretion, it is advisable to have an angle of 60° or more for the HIREC coated surface. Snow accretion can be reduced by setting an angle of 60° or more of structure's surface with HIREC coating. Note: The performance of the snow accretion using HIREC may vary according to the design conditions and designs of the structure which may include the face angle of the structure surface, shape, size and positions of the separators. Prior consultation is crucial before applying the HIREC.